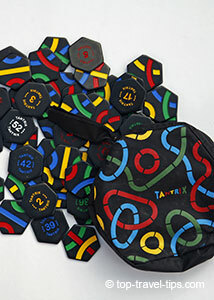 The Tantrix game is the ideal to bring along with you on your travels. When you are travelling you are always pressed for space in your luggage. Being able to play fun strategic puzzle game that does not take up much space is therefore ideal. This puzzle game fits that criterion perfectly. What Makes Tantrix The Perfect Travel Game? First, it is lightweight and does not take up much space in your luggage. It is made from plastic tiles that make them both light and durable. That is the practical side, which is of course important. More importantly though, it is fun, addictive, challenging and can be played on your own or with others (2-4 players). Playing though requires flat surface, like a coffee table, meaning it is not easy to play while en-route. It is however great to play by the pool, after dinner or on a rainy afternoon... home or away. The idea behind the game is remarkable simple (as many of the best ideas are). The aim of the game is to create long line or loop in your chosen color. The person that has the longest line or loop (you simply count the tiles that make up the line) at the end of the game wins. Nothing complicated with that. You must follow few simple rules, i.e. what you can and cannot do and off you go. Sounds really simple and that what it is. But... playing takes skills (forward thinking and strategy) and luck (getting the right tiles when you need them). This is what makes the game such a fun and so addictive. Tantrix is a game of strategy. In some ways it reminds us of playing chess, except easier to get the hang of it for novice players. Each game takes only about half an hour to play, which most agree is good time length, especially for younger players. One of the great things is how versatile this simple game is. You can start with few tiles and work your way up to more complex structures. Playing this tantalizing game can be remarkable easy as well as remarkable challenging. You can play with others or create your own patterns and solitaire puzzles. Both are equally fun in our experience. We have enjoyed playing Tantrix ever since we first tried it. We have played it frequently and given few as gift sets to friends and family. In our opinion, it is the perfect travel game for everyone that enjoys strategy and puzzle games at the same time. Where To Buy Your Tantrix? The easiest way to buy yours is one-line, e.g. through Amazon . They have very large range on stock and if you buy for more than $35 you get free shipping. Or signup to their Prime service and you get free next day shipping on all Amazon delivered orders. You might want to check their customer reviews, they are most highly positive and informative. We first came across this tantalizing game during our tour around New Zealand, when we visited Puzzling World, Wanaka. Puzzling World is great place for everyone that enjoys puzzle games / mind games. We highly recommend dropping by if you are ever in the neighborhood.